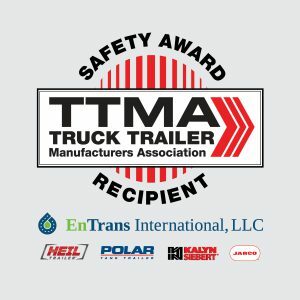 Athens, TN – (May 7, 2018) – EnTrans International, LLC, recently received Plant Safety Awards from the Truck Trailer Manufacturers Association (TTMA) for four of its trailer manufacturing facilities, making it the only multi-category winner in the industry. The awards were presented to Todd Finney, Senior Vice President, EnTrans International, at TTMA’s 76th annual convention in Santa Ana Pueblo, New Mexico, on April 19. EnTrans International’s largest tank trailer plant, Juarez Trailer Operations in Juarez, Mexico, earned its first TTMA Plant Safety Award in Category A, which is awarded to plants with more than 750,000 man-hours per year. Heil Trailer, Polar Tank Trailer and Jarco products are manufactured at the Juarez facility. That includes every product segment from dry bulk to stainless. The state-of-the-art Juarez facility opened in 2014, spans over 350,000 square feet, is an ASME U certificate holder and a National Board R certificate holder. With the latest fabrication and manufacturing equipment, Juarez is one of the most advanced facilities in the industry. Minnesota Trailer Operations in Holdingford, MN, also won its first TTMA award. It was recognized in Category B for plants with 300,000 to 750,000 man-hours per year. Polar Tank Trailer and Heil Trailer stainless and aluminum products are manufactured at the Minnesota facility. TTMA recognized Kalyn Siebert’s manufacturing facility in Gatesville, Texas, for being the Most Improved in the Truck Trailer Division for 2017. The ISO-certified Gatesville facility spans 260,000 square feet across 31 acres and has an annual capacity of more than 1,000 units. Heil Trailer sponsors its own safety award for fleet carrier members of the National Tank Truck Carriers (NTTC). Every year, the safest bulk carriers in the industry are recognized with Outstanding Safety Performance Awards. The awards were established to underscore the importance of safety to both suppliers and carriers within the tank truck industry. For more information about EnTrans International, LLC, and its brands, visit entransinternational.com.